Starring: Liam Neeson (Batman Begins), Famke Janssen (X-Men), Maggie Grace (Lockout) and more. Rated: Rated PG-13 for violence, some sensuality, intense action and mild language. If Taken and Taken 2 were combined into one big movie, almost nothing would be remembered from the entire second half except, possibly, lackluster acting, ridiculous clichés, and the fact that if you ever run into Liam Neeson, be sure that, somewhere, he has his luggage that is full of grenades, guns, and other such destruction causing weaponry. A film of revenge and relationships develops as this movie unfolds. This time it is a look at two daddies who are upset about what has happened to their kids. Bryan Mills (Neeson) is upset over what happened to his daughter Kim, and Murad Krasniqi (played by the familiar bad guy Rade Serbedzija) is upset that Mills killed his son when trying to rescue his daughter. So…as expected, Mills invites his daughter and ex-wife on a trip to an area where the bad guys happen to be…and, of course, those who took before are seeking to retake once again. Unfortunately, it is nowhere near as exciting, exhilerating, or extra fun as the first. Forced to accept certain unplausible events, viewers may sit there in disbelief as much of the action revolves around Kim herself who, under the direction of her father, is able to pull of some stunts that almost no one ever could. EVERYONE remembers that scene! And if you like to think of Liam Neeson’s character in a good way…then just rewatch Taken and leave it at that. Okay, that’s a bit harsh…but almost truly worthy. Taken 2 is not ALL bad. I mean, aside from some semi-amateurish acting (pointing at you Famke Janssen and others), ridiculously bad pacing in the beginning, somewhat outlandish navigation and map skills, no true buy in to the practically dialogue-free villains themselves, and events that lack explanation, Taken 2 at least has a few fight scenes that show that you still don’t want to mess with Liam Neeson, and it succeeds in keeping the same continuous cast as the previous film did. That’s a plus, right? While Besson did not direct this film, I expected more…especially after the first one and considering the fact he wrote the screenplay. He takes us on less of an exciting trip than his fans deserved. With an highly unsatisfying and anti-climatic ending, I left the theater questioning why Neeson would sign up for a sequel to one of his most successful films if it didn’t quite meet up to par…then I remembered that he was in Battleship (and that the director also directed the terrible, or shall I just say, disappointing film Colombiana) and shrugged my shoulders as I left the movies. Wish I could tell you that this one makes the mark, but it doesn’t. 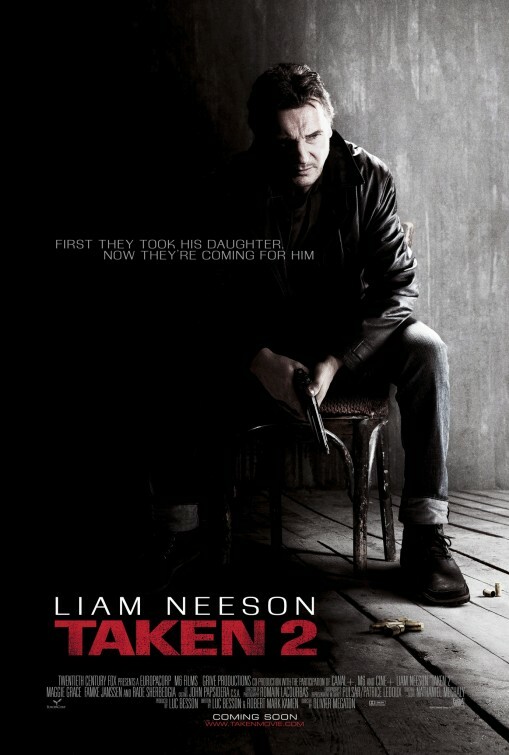 Taken 2 takes you nowhere but to the land of disappointing sequels once again. A 1? Seems kind of drastic compared to some of the other films you’ve given higher scores to lol. Its not a ten worst candidate, for me, but its definitely not worth recommending. Below average effort… and youre right, there’s a lot of times where the movie expects you to accept some really really stupid things. Im at more like a 2 than a one out of five, but we’re not far off, bud. We once again see eye to eye. I kept running through the numbers in my rating system hoping I could give it a better score…but the numbers didn’t work out that way and I had to stay true to the system. I really wanted to like it more. Oh well. I expected it to be like the first one…and it was far from it. too much ridiculousness to have to swallow. you’re right. it wasn’t necessary. But it’s because of the first one that I was expecting that or more from the second. That disappointment aside, the movie still wasn’t that good.